Your furry friend, the hamster, is a curious and adorable little animal but they’re also vulnerable to injury and illness that can cause death. We know this news might have you concerned about your small furry pal, maybe even nervous that your hamster’s behavior isn’t normal. But don’t worry! We were curious too and found out there are ways to prevent your hamster from getting sick, learned some tips on how to keep your hamster healthy and safe, and what kind of behavior to keep an eye on. Some hamsters die because of illness or disease, such as Wet Tail Disease while others pass away due to preventable mistakes such as falling from a dangerously high height. Hamster behavior can be confusing at times. Is my pet just burrowing? Just hiding away to hibernate? Maybe they’re sick and require a trip to the vet? Although hamsters do have a shorter lifespan than most household pets, if you take care of your hamster and watch for signs of illness, they can live a healthy and happy life. Here’s how to do just that. Just like any other living creature, hamsters can get sick and die. The cause can be a bacterial, viral or fungal infection. When these are left untreated – and sometimes even with the best veterinarian care – they can sometimes be fatal. Hamsters easily spread disease amongst each other, so if you have more than one hamster in a habitat and think one might be sick, you should separate them right away. 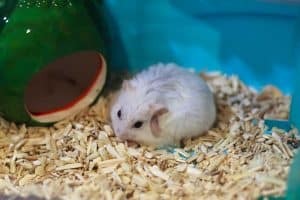 Your hamster might have picked up a virus from an ill hamster in their cage at the pet store, or they could have developed an illness after you brought them home. Either way, none of us wants to see our pet unwell. With that in mind, here are a few common hamster illnesses that, if left untreated, can result in death. For a more detailed coverage of these and other ailments, make sure you read our guide about the 7 health issues in hamsters that every owner needs to know about. We love to coo over hamster with chubby cheeks, commenting on how adorable their little faces look. But there are occasions when those puffy cheeks are a cause for concern. Your hamster can develop an infection, caused by bacteria. This infection can result in an abscess and can be extremely painful for your pet, requiring drainage and antibiotics. If you notice swelling or a lump, hard or soft, anywhere on your hamsters’ body, it’s necessary to visit a veterinarian right away. Left untreated, the bacteria which causes the abscess can get into the hamster’s bloodstream and cause a dangerous condition called bacteremia. Since the hamster’s body is so small, once bacteremia sets in, there’s usually no going back. That’s why you should not delay treatment – get your hamster to the vet as soon as you notice any lumps. It’s surprising for many people to learn that a hamster can catch a cold, just like me and you! The little critters can develop the sniffles, sneezing, or even have a cough. If you notice your hamster has a wet nose, having difficulty breathing, or is wheezing, a cold might be the culprit. But, even though a cough is relatively harmless for humans, a respiratory infection can lead to a more serious illness in your hamster. If you believe your pet has a cold, it’s best to consult with a medical professional for advice on how to treat and keep your hamster healthy. In other words, yes, your hamster needs to be seen by a qualified veterinarian. Triggered by bacteria and stress, wet tail disease is unfortunately very common among hamsters and is highly contagious. Sadly, even if caught early, most wet tail disease diagnoses end in death with 72 hours. If you notice your hamster has diarrhea, unexplained wetness around the tail, low energy, fatigue, or aggression, it is critical to seek medical attention for your pet as soon as possible. Your veterinarian can accurately assess your hamster and discuss next steps of care, or prescribe antibiotics if required. Read more in our guide about Wet Tail Disease in hamsters. By following a few simple tips, you can help keep your hamster safe and encourage a healthy life for your pet. Hamsters easily catch and spread disease. They can even catch colds from humans! If anyone in your household has a cough or the flu, avoid handling your pet hamster until you’re feeling better, don’t cough directly on your hamster or into their cage, and always wash your hands before and after holding your hamster. If you have more than one hamster in a habitat and you notice one is sick, it’s best to separate them to avoiישצדd spreading disease. When your hamster is healthy again, you can reintroduce your pets when you and your vet think it’s safe to do so. Try to avoid keeping your hamster in a place that is drafty, too cold, or has excessive moisture (such as an unfinished basement). Try to keep your hamster’s cage away from drafty windows. You might want to invest in a heat lamp if it’s difficult to keep the room warm. Don’t confuse a heat lamp with an artificial light. Excessive light will actually disrupt your hamster’s natural rhythm. Hamsters are nocturnal. They love to play, eat, and exercise in the dark! Something as simple as your hamster slipping out of your hands and on to the floor can be deadly for your pet. It’s important to be very careful when you, a friend, or a child are handling your hamster. If you allow your hamster to run and explore outside of their cage, make sure you prevent injury and keep them in a safe, enclosed area. For instance, a fall off of a bed could mean a severe injury and a trip to the vet for your pet. Could your hamster be hibernating? It’s very common for hamsters to burrow and hide in their habitat. Hamsters are inquisitive creatures by nature and love to explore their cages, creating tunnels and hiding beneath their bedding. If your hamster has burrowed under the bedding and won’t come out – could he be hibernating? While wild hamsters can sometimes hibernate in the winter, most domestic hamsters do not. Hamsters only hibernate if they’re in an unusually cold environment. They then move around to find food to eat, water to drink, or if they are scouring for extra materials for their nest. 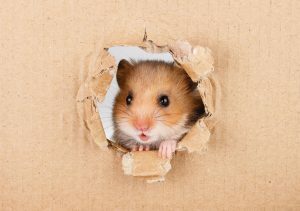 If you think your hamster might be hibernating, there are a couple of tricks to get your hamster up and moving again. Many pet owners use a heat lamp in their hamster’s habitat to keep them warm and provide ample light, especially if they’re in a room that does not hold in heat. Hamsters prefer warm climates, and if it gets too cold, they can go into hibernation. Hamsters don’t like temperatures that are extreme either way, too low or too high, so be sure to keep your pet in an environment between 65- and 75-degrees Fahrenheit. Sometimes hamsters will go into hibernation mode because they can’t find enough resources to stay alive. While you want to make sure you’re not overfeeding your hamster, they can be hoarders, if you happen to notice your hamster isn’t active, try replenishing their dish with fresh food and water. Keep an eye on your hamster, watch if they explore your offering and gather a helping of food. Don’t worry! You don’t need a stethoscope for this. Just look closely at your hamster, if they’ve gone into hibernation, they will be taking very slow breaths. It may be difficult to see whether or not your pet is breathing. You might need to remove your hamster from their cage carefully. Try not to worry if your hamster feels cold. Hibernation can trigger low body temperature. Apply slight pressure very gently on their chest to feel for a heartbeat. If you are concerned your hamster isn’t hibernating and might be sick or worse, dying, it’s essential to consult a veterinarian. There is no way to know for sure, but there are a few telltale signs your hamster might be dying of old age. You might notice your pet’s eyes are dull. Their fur may become thinner than usual. You may notice decreased appetite unrelated to illness, or change in normal behavior such as they might begin to urinate where they nest. Tragically, a hamster’s lifespan is only around two years. Hamsters can die suddenly due to old age, even while engaging in normal activities. Your hamster might be enjoying their favorite activity such as running on their exercise wheel or nibbling away on their favorite snack when they pass away. If you notice your hamster isn’t moving and feels stiff to the touch, it is possible your pet has passed away. You may want to consult with your vet to confirm your pet’s diagnosis and determine if you would like to proceed with a burial. For many, the loss of your pet is similar to the loss of a family member and a heavy load to bear. It’s natural to feel upset and grieve the loss of your hamster while you find a way to honor your pet. While some people prefer to discuss their feelings with loved ones, others would rather spend time alone while they heal. Remember, your hamster may not be with you for your whole life, but to your pet, you made their life whole.